Home » Activity Books » Anouska Jones » Creativity » Education and Literacy » Non-fiction » Reviews » Reviews by Anouska » Writing » Review: Rip the Page! The subtitle of this book — Adventures in Creative Writing — is perfect. For that's what this book is: an adventure from the first page to the last. 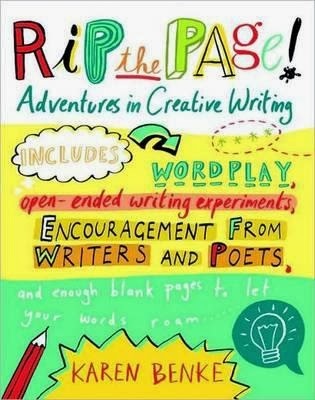 For any child who wants to write but doesn't know where to start, for any parent or teacher wanting to ignite that creative spark, for anyone of any age wanting to create with words … this book is guaranteed to have you picking up your pen or pencil and enjoying every second of the creative process. Author Karen Benke is a writing coach, free-write facilitator and poet–teacher in the California Poets in the Schools program, where she specialises in leading workshops for children. And this wealth of experience is evident in the cleverly structured exercises that form Rip the Page! Every page oozes humour, warmth, encouragement and fun. Rip the Page! might be aimed at children, but as far as I'm concerned this is an invaluable resource for anyone wanting to bring more creativity into their life. A second book in the series, Leap Write In!, is also available.